This featured website contains 50 cases of DCIS with or without microinvasion, make your choice and get online feedback. For beginners a case by case feedback is provided. Consistency in recognizing microinvasion in breast carcinomas is improved by immunohistochemistry for myoepithelial markers. Cserni G, Wells CA, Kaya H, Regitnig P, Sapino A, Floris G, Decker T, Foschini MP, van Diest PJ, Grabau D, Reiner A, DeGaetano J, Chmielik E, Cordoba A, Andreu X, Zolota V, Charafe-Jauffret E, Ryska A, Varga Z, Weingertner N, Bellocq JP, Liepniece-Karele I, Callagy G, Kulka J, Bürger H, Figueiredo P, Wesseling J, Amendoeira I, Faverly D, Quinn CM, Bianchi S.
Microinvasion is the smallest morphologically identifiable stage of invasion. Its presence and distinction from in situ carcinoma may have therapeutic implications, and clinical staging also requires the recognition of this phenomenon. 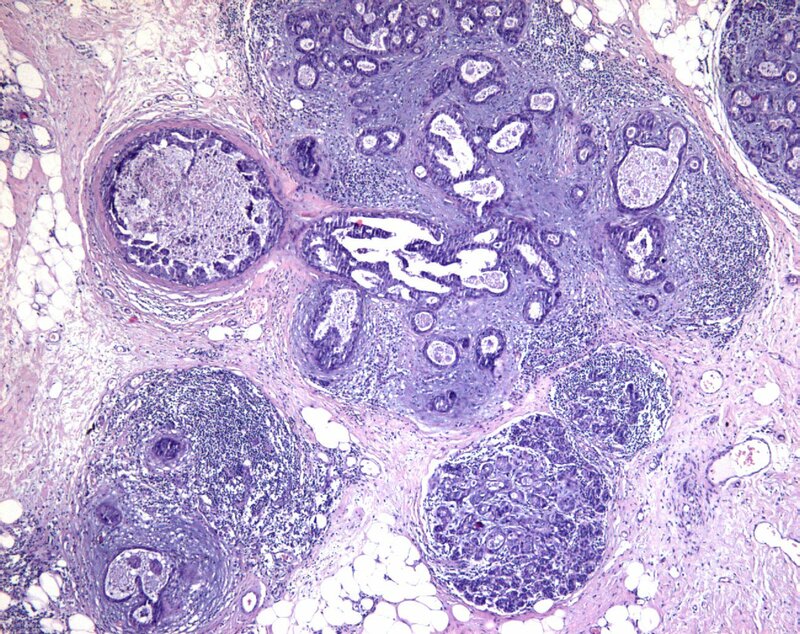 Microinvasion is established on the basis of several morphological criteria, which may be difficult and not perfectly reproducible among pathologists. The aim of this study was to assess the consistency of diagnosing microinvasion in the breast on traditional haematoxylin and eosin (HE) stained slides and to evaluate whether immunohistochemistry (IHC) for myoepithelial markers could improve this. Digital images were generated from representative areas of 50 cases stained with HE and IHC for myoepithelial markers. Cases were specifically selected from the spectrum of in situ to microinvasive cancers. Twenty-eight dedicated breast pathologists assessed these cases at different magnifications through a web-based platform in two rounds: first HE only and after a washout period by both HE and IHC. Consistency in the recognition of microinvasion significantly improved with the use of IHC. Concordance rates increased from 0.85 to 0.96, kappa from 0.5 to 0.85, the number of cases with 100 % agreement rose from 9/50 to 25/50 with IHC and the certainty of diagnosis also increased. The use of IHC markedly improves the consistency of identifying microinvasion. This corroborates previous recommendations to use IHC for myoepithelial markers to clarify cases where uncertainty exists about the presence of microinvasion. Microinvasive carcinoma is a rare entity, and seeking a second opinion may avoid overdiagnosis.